To promote health and advance equity through nursing leadership. Our mission is to create an inclusive education, research and practice culture that inspires inquiry, collaboration and innovation. View our Strategic Plan for more information. Registered nursing, a self-regulated profession, requires that nurses commit to and accept the responsibility to conduct themselves as professional and ethical practitioners. Nursing is the integration of art, science, and wisdom to practice toward the public good. Multiple perspectives inform nurses’ ways of knowing (epistemology) and allow us to embrace ambiguity and diversity. 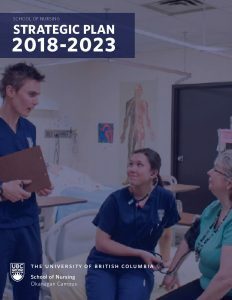 Sciences, humanities, and nursing research form the basis of essential knowledge in nursing required for safe, ethical, evidence-informed and culturally safe nursing practice. Nurses are committed to interprofessional collaboration for the promotion of safety and improved health outcomes. Nursing embraces compassion and caring as a relational and mindful practice for the promotion of optimal health and healing. Nurses are committed to social justice and universal rights that impact health for all. Nurses respect, protect and advocate for individuals’ and communities’ rights to self-determination and self-expression.